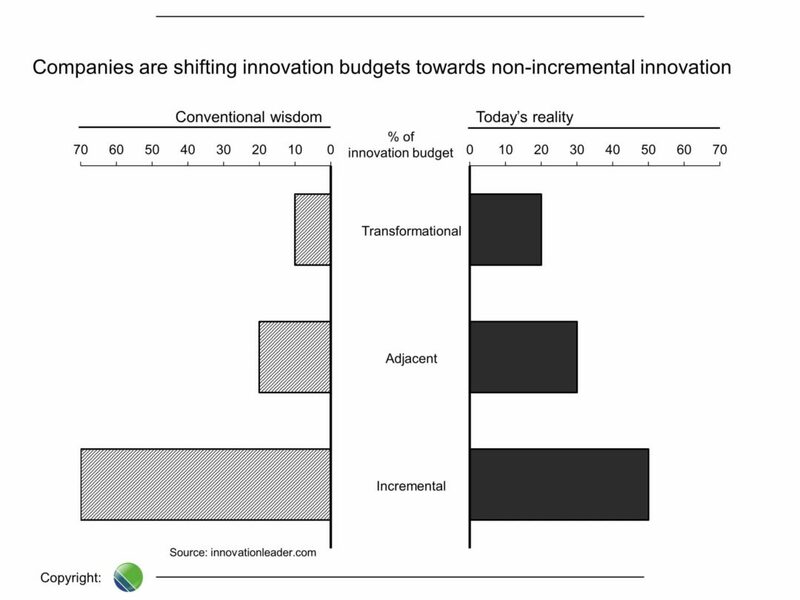 How can companies generate more business impact from non-incremental innovation? This the ‘billion-dollar-question’ Dr. Ralph-Christian Ohr and Frank Mattes are working on. Typically, companies have little problems in generating ideas for adjacent, radical or even disruptive innovation and in validating the most promising ideas. On the other end of the process, companies have systems to grow material businesses and incrementally improve their performance over time. But for many companies, the transitional Scaling-Up phase in-between is a ‘Valley-Of-Death’, in which many promising concepts die on their journey from idea to business impact. In two articles, this one being the first, Ralph-Christian and Frank put Scaling-Up in the context of a foundational framework for modern corporate innovation management which they call ‘Dual Innovation’. 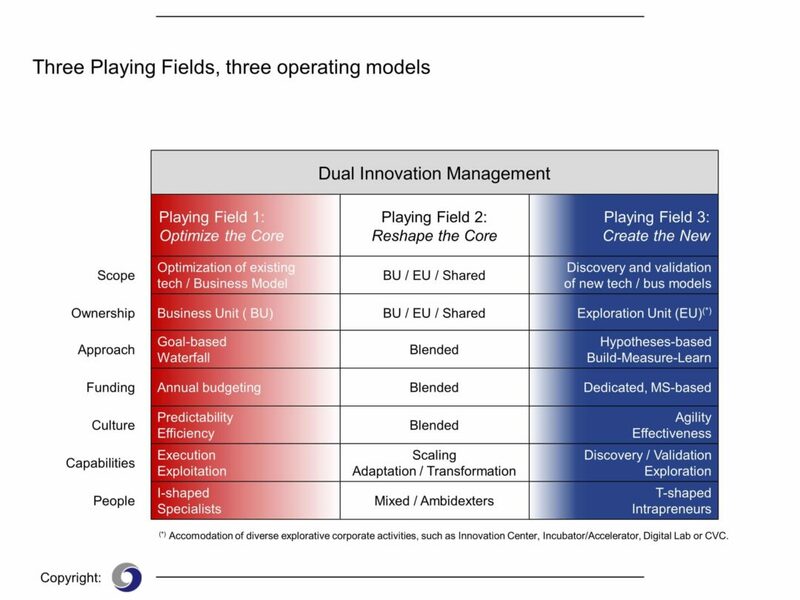 In Dual Innovation, this Playing Field has its own, dedicated operating model, just like the explorative and the exploitative innovation domain. Once companies put these three ‘Playing Fields’ and their operating models under one roof, they have a modern and comprehensive innovation management approach to ‘Optimize the Core’, ‘Reshape the Core’ and ‘Create the New’ at the same time. (B) Incremental or adjacent (‘exploitative’) innovation, managed by BUs. However, as statistics show, results from non-incremental innovation are still disappointing across the board. So separation seems to be a necessary but not a sufficient condition to win in non-incremental innovation. Consequently, the solution to the above-mentioned challenge requires more thinking than just separating (A) and (B). But what exactly is the missing piece? This question has been the focus of Ralph-Christian and Frank’s work for almost a decade. Step-by-step, with every client project and every Peer Group they sharpened their thinking. The conclusion that they arrived at is that in many companies the second part of organizational ambidexterity – the ‘integration part’ – is highly under-represented and needs to be designed. In the past, many companies allocated innovation resources mainly to ‘safe bets’ and only a small fraction to uncertain initiatives. Quite often, the ‘Google Ratio’ of a 70-20-10 percent split of resources between incremental, ‘adjacent’ and ‘radical/disruptive’ innovation was applied. But throwing more money into non-incremental innovation alone does not produce results. (B) lack of an end-to-end process, comprising proper transition of the innovation into the core. Lack to offer a comprehensive set of dimensions for an adequate design of the interface. Do not acknowledge that there different Scaling-Up pathways (internal / external, multiple spin-in / spin-out junctions). Playing Field 2 – Reshape the Core: Ensure (a) Adaptation of core business via industrializing ‘new but proven’ technologies and/or ‘some changes to the business model’ (e.g. X-as-a-service for the same customer base) and (b) Scaling-Up. In this set-up, Playing Field 2 is a mandatory piece in a modern corporate innovation management with its own, dedicated operating model, establishing an end-to-end-process for radical or disruptive innovation initiatives, and the foundry in which Adaptation initiatives (e.g. X-as-a-service strategies in Digital Transformation) play out. As many companies have found, establishing this interplay is hard. One of the key reasons is that corporate innovation units and BUs / central corporate functions run on disparate paradigms (e.g. agility vs. predictability, mid-to-long-term vs. short-term focus, managing uncertainty vs. minimizing risk). These different paradigms will inevitably lead to ‘Areas of Tension’. Integrating the BU / exploitative and the Corporate / explorative innovation perspectives via a Playing Field 2 with a distinct operating model is what makes up a modern, future-proof corporate innovation management. We have coined the term ‘Dual Innovation’ for the underlying framework. In search of Scaling-Up excellence, Ralph-Christian Ohr and Frank Mattes have had the great opportunity to work with leading companies – one in the Fortune 15 and several in the Fortune 200 – on how to become better in scaling up validated non-incremental innovation and how to build the company’s Scaling-Up capability. In the second article of this two-part article series (coming soon) they will share insights on how this can be done.